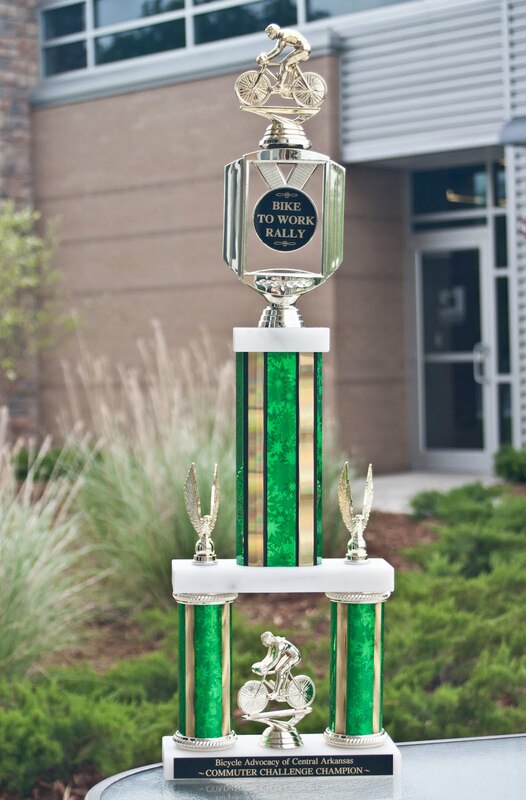 Last year, Garver's North Little Rock, Arkansas office won the trophy for the largest percentage of riders in our business size. The Bicycle Advocacy of Central Arkansas is again holding a Bike to Work Rally on Friday, so let's pump those pedals and defend our title as commuter challenge champion! Also last year, Garver's Fayetteville, Arkansas office had the highest average ridership in the large workplace category during the biker commuter challenge. This year, fill out a Bike to Work Week Commuter Challenge Form and help Garver win again. This challenge is based on a company's percentage of bicycle commuters and the longest single commute. Also in Fayetteville, the Bike to Work Week Proclamation and Ride has been rescheduled to today. It begins at 5 p.m. at the Fayetteville Square near the Town Center on Mountain Street. The casual urban trail bicycle ride to Mellow Mushroom Pizza Bakers will depart at 5:30 p.m. In Oklahoma City, Oklahoma, Bike to Work Day is May 21. In Tulsa, Oklahoma, the city has a week of biking opportunities. For Nashville, Tennessee bikers, visit this month-long bike event calendar to see how you can participate. You may also visit Google to use their bicycling directions to find the best route to your job. If you have additional information you’d like to add to this blog about Bike to Work Week opportunities within our region, please contact me. Happy biking!